Time and Future are the priorities of the present edition. 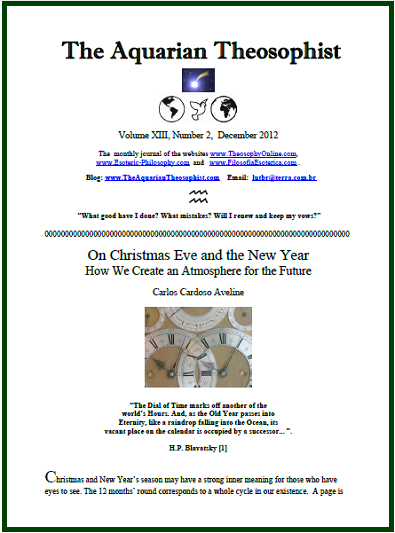 The opening article is entitled “On Christmas Eve and the New Year”. It examines how esoteric philosophy sees the end (and the beginning) of a 12 months’ cycle. Since there is nothing better than listening to Sages during the solemn closing of a year, the gift to the readers on pages 7, 8 and 9 is the transcription of two lectures by Musonius Rufus, the Stoic philosopher of ancient Rome. Musonius examines which is better, Practice or Theory. He also talks about the actual process of Training and Self-Preparation. On p. 10, “Just Above the Line of the Horizon” is a note on the karmic tides faced by the theosophical movement in its evolution, and on their relation to the cycle of Jupiter, of 12 years. Co-regent of Pisces and the Master of Sagittarius, “the Archer”, Jupiter presides over Philosophy, Optimism, Work for the Future – and Universality. On pp. 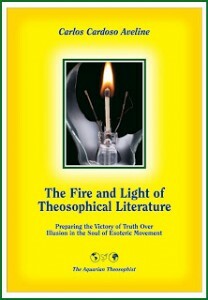 11-12, the article “The Ethos of Global Citizenship” looks at the present online world and sees in it an astral light version of the ancient Agora, or the global market place where – just like in ancient Greece – everyone is free to talk and to hear each other about life and about the art of living. A short note on p. 12 gives evidence that the Masters of the Wisdom “look at the future, not at the present”, according to H. P. Blavatsky. On p. 13, “A Question on Blavatsky-Judge Letters”. On p. 13-14, the reader finds “The Next Humanity of Brotherhood” and a fragment by Robert Crosbie under the title of “Where Can a Real Christmas Take Place?”. December edition closes with an invitation to each reader and his or her friends. Its title is: “An Invisible Christmas Gift”.